It’s tough to manage quality of care, operating costs, patient data privacy, and electronic health records while supporting physicians and clinicians, without having a solid infrastructure to back you up. At the center of all this activity is your IT organization. 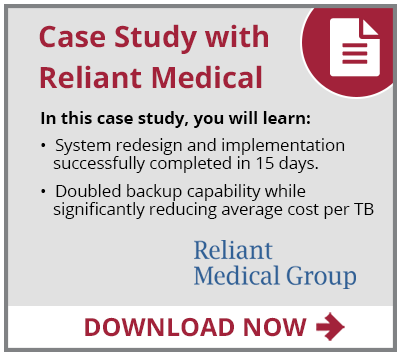 An effective, highly optimized IT infrastructure is critical for navigating through this sea of change and ensuring that your administrative, financial, and clinical operations are all working together towards successful patient outcomes. Our expertise and knowledge of IT requirements for healthcare organizations make us a uniquely qualified and objective solutions provider to implement server, virtualization, storage, image archiving, email archiving, file archiving, backup/recovery, and deduplication solutions. Whether you’re looking for an on-premise, cloud, or hybrid solution, we have the experts to architect and deploy rock solid solutions.